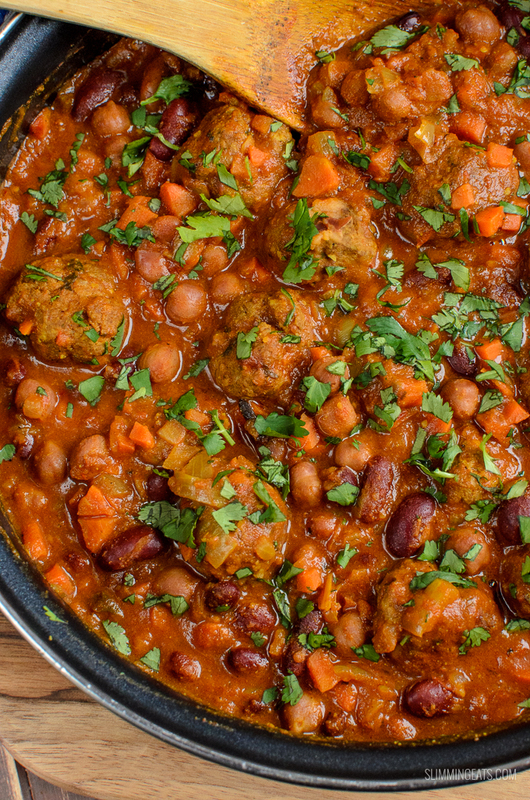 Amazing Indian Spiced Lamb Meatball and Bean Curry with a delicious flavoursome sauce, perfect with a variety of sides and suitable for freezing. Lamb has got to be one of the best choices of meat for a curry, don’t you think? It just has a unique flavour and goes amazingly well with all those spices. 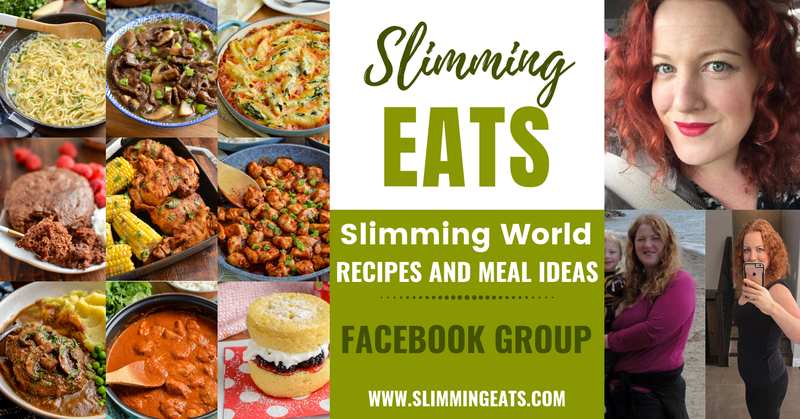 Most get put off using ground lamb (mince) on Slimming World because it’s pretty darn hard to find a less than 5% fat variety, so not syn free. However you should never let that sway you, while it’s great to have syn free meals, sometimes you just have to have what you fancy. Ground lamb (mince), even though it has a syn value, is not too bad once divided into portions, if you use a smaller amount paired along with lots of healthy vegetables or legumes. Just always double check the syn value of the ground lamb you use, as it can vary in syns from store to store. 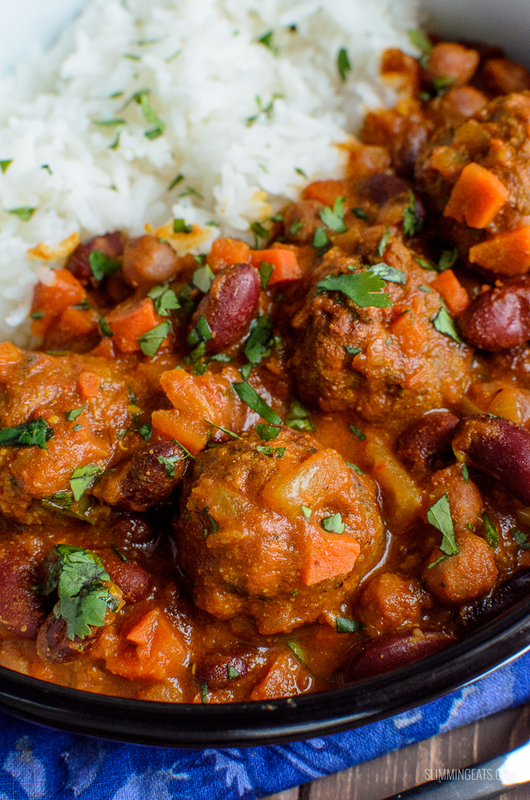 I love using a six bean blend for this Lamb Meatball and Bean Curry. The canned six bean blend contains chickpeas, red and white kidney beans, black-eyed peas, romano beans and baby lima beans. Meaning this dish is has a great source of protein. 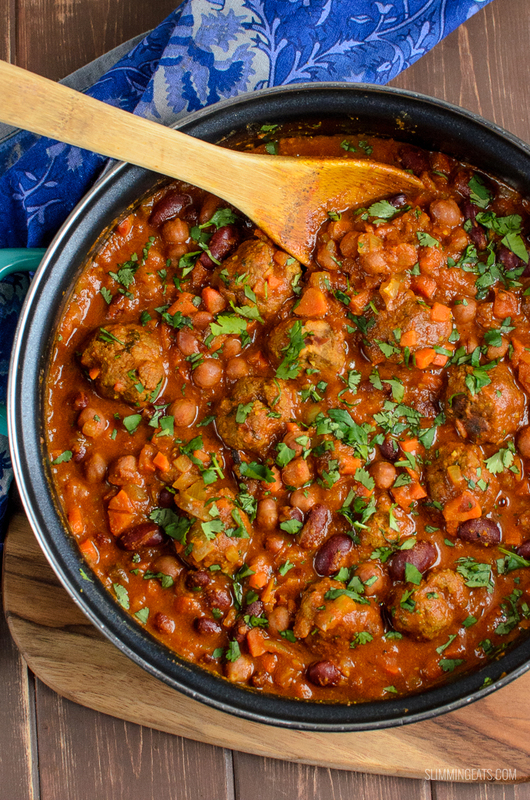 If you have trouble finding a similar canned mix, you can just use a similar bean of choice – chickpeas are great, as are white beans. 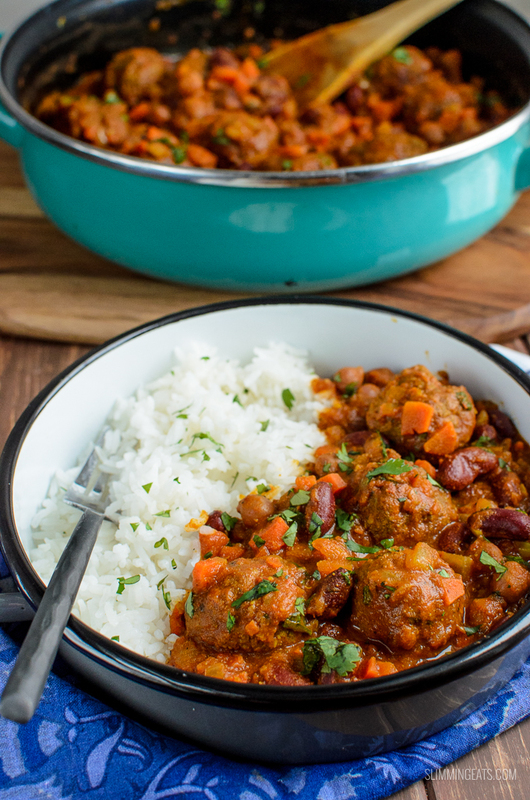 This lamb Meatball and Bean Curry will go with various different sides. I tend to just go for regular steamed basmati rice. But you could also serve it with this Zucchini Pilau Rice or Sweet Corn Pilau Rice and if you don’t fancy rice, then my Syn Free Perfect Oven Chips are also a great choice. 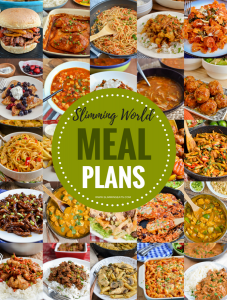 and if you need more recipe ideas – Head on over to my FULL RECIPE INDEX where you will find over 500+ delicious Slimming World recipes to choose from and all are searchable by syn value, meal type, ingredients etc. 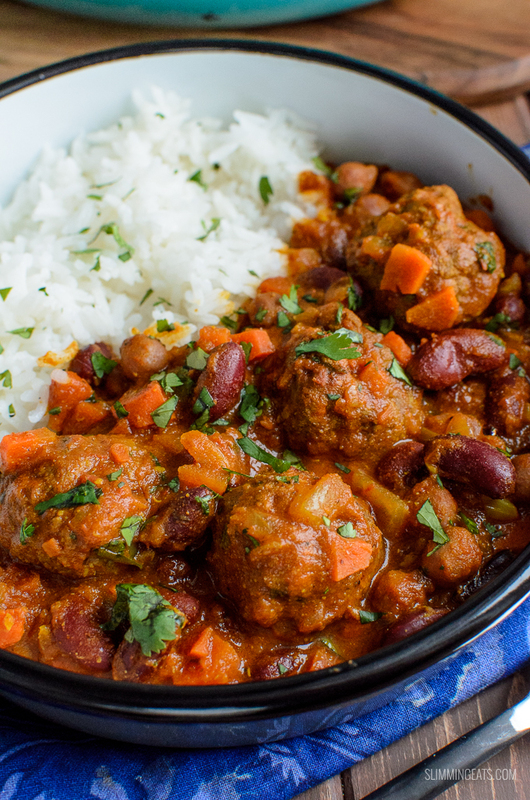 Another option if you wanted to save on the syns and keep this syn free, is to use lean cuts of lamb instead of mince, or even beef and if you are cooking for less than 4 people, you will be pleased to know this Lamb Meatball and Bean Curry is perfect for freezing. So tub up those leftovers and freeze them for another day. HOW CAN I ADD A 1/3 SPEED FOODS TO THIS LAMB MEATBALL AND BEAN CURRY? There are already some speed vegetables in the curry itself, but you can easily up those with your choice of side, reduce you rice portion and serve with some additional side vegetables, or you could skip the rice altogether and go for this yummy syn free Roasted Cauliflower Rice or Roasted Butternut Squash and Cauliflower Rice. 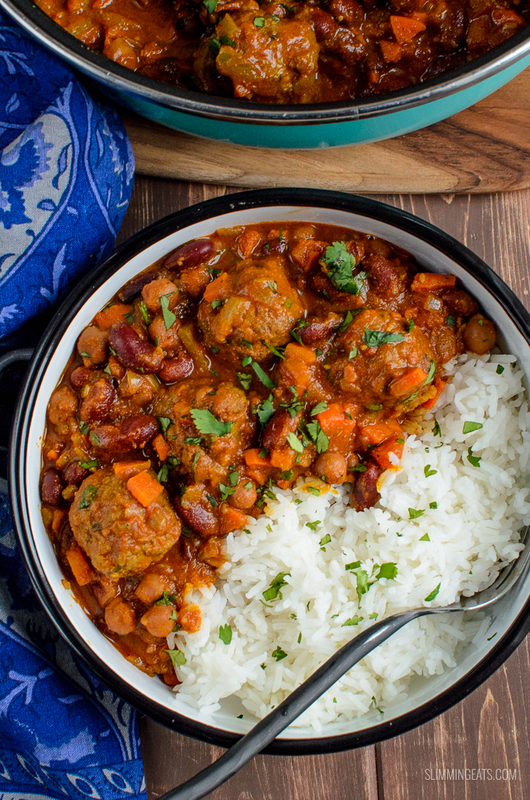 WHAT KITCHEN ITEMS DO I NEED TO MAKE THIS LAMB MEATBALL AND BEAN CURRY? Always love to finish off any curry with a good sprinkling of fresh chopped Cilantro (coriander). It’s not to everyone’s taste, some hate it, but I LOVE the flavour it gives, so much so, I sometimes add a little bit to salads. Totally optional of course, it won’t affect the Lamb Meatball and Bean Curry if you don’t add it. If you love a dollop of yoghurt on your curry too, feel free to add some. I didn’t this time around, but I often like a bit of mint yoghurt on the side. I just mix fat-free plain yoghurt with a little lemon juice, salt, pinch of turmeric for that yellow authentic colour like from the Indian and fresh chopped Mint, must be fresh – yum!! Spray a frying pan over a medium-high heat with spray oil and brown on all sides, remove and set aside. respray the frying pan with spray oil, add the onion, garlic and ginger and gently fry for approx 2 mins until softened. Add the carrots and all spices and stir to evenly coat. Simmer on a low heat covered for approx 30 mins. Make sure to check the syn value of the ground lamb you use, as they can vary in syns. 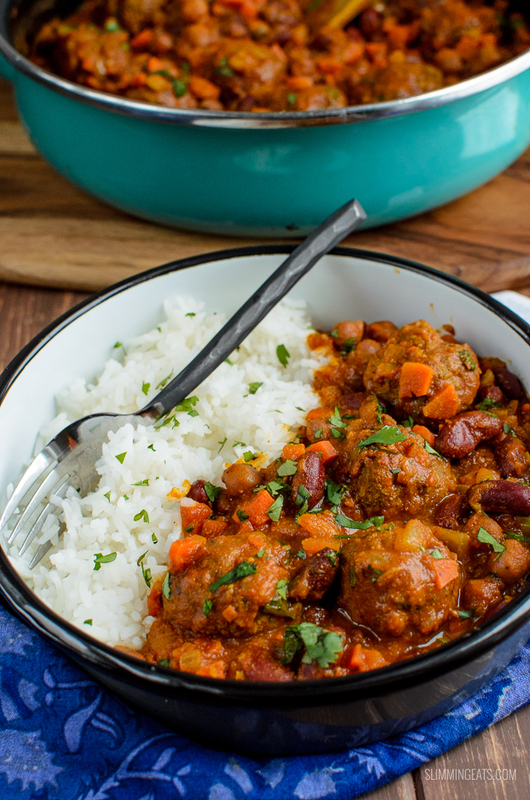 Quick question – are the haricot beans free on a red day? thanks for your help and this great website! no sorry, they are syns on a original day. I have edited the recipe to reflect that, thanks for pointing it out. What a gorgeous curry. I’m not ususally a fan of lamb unless it’s a roast joint but this is really tasty. good to hear you enjoyed it. It says serves 3 but you say make enough meatballs for 2…I’m guessing this recipe just serves 2? Sounds lovely, can’t wait to try it! Love your recipes. Am half way through cooking this one so I’ll let you know how it goes! Please may I ask you to list the ingredients in the order that they are to be used please? Hi Kirsty, thanks for commenting, so glad you enjoy them. Oh my goodness!!! Gorgeous. 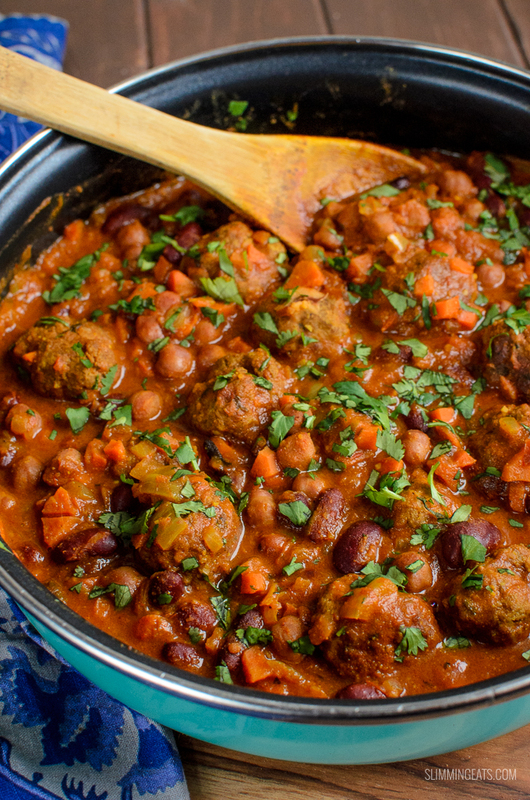 Okay so I used lean BEEF mince instead of the lamb and I used chick peas instead of the beans, mainly cause I had them to hand as I was going to do a different recipe. So glad I changed my mind and did this one. It’s yummy and delicious and one of those feel good meals. Thanks for this one.